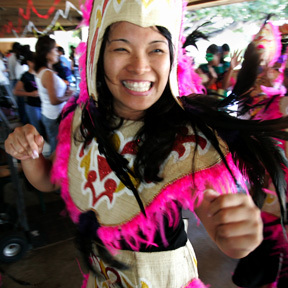 WEEKEND SCENE » Socelyn Ramos and other Ati-Atihan festival dancers in traditional Visayan dress took part in the annual Filipino Christmas celebration Pasko yesterday at the McCoy Pavilion in Ala Moana Beach Park. Families spent the day enjoying Filipino food, arts, crafts, music, song and dance. After four decades in Hawaii, the wife of a sakada is fulfilling a dream: to become a U.S. citizen so she can vote in the next election. At Dragon Gate Bookstore, owner Emily Ng caters to fans of Asian cinema, classic king fu and the work of the Shaw Brothers. Hawaii has to play at UNLV tomorrow after upsetting Michigan State. Briana Solidum helps aides to the governor arrange events and public tours of one of the state's most famous homes. Governor Lingle has released money for planning of a new prison and a drug treatment facility for inmates on Oahu.